Object storage is a secure, simple, scalable, and cost-effective means of embracing the explosive growth of unstructured data enterprises generate every day. Many organizations, like large service providers, have already begun to leverage software-defined object storage to support new application development and DevOps projects. Meanwhile, legacy enterprise companies are in the early stages of exploring the benefits of object storage for their particular business and are searching for how they can use cloud object storage to modernize their IT strategies, store and protect data while dramatically reducing the costs associated with legacy storage sprawl. 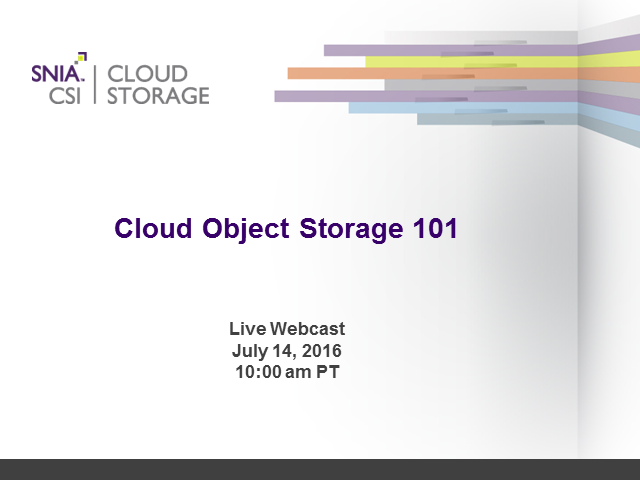 This Webcast will highlight the market trends towards the adoption of object storage , the definition and benefits of object storage, and the use cases that are best suited to leverage an underlying object storage infrastructure.